Aqua America's Stock Plunged 7.6%. Should American Water Works Investors Fear a Similar Scenario? The market didn't like Aqua America's news on Tuesday that it's buying a big natural gas company. Here's why American Water Works is extremely unlikely to make a similar move. On Tuesday, shares of water utility Aqua America (NYSE:WTR) plunged 7.6% on more than seven times average trading volume. While this type of price swing is a relatively minor bump for some high-flying stocks, it's a humongous sell-off for a water utility stock. The magnitude of this one-day drop might even be unprecedented in the water utility space -- at least among the industry's biggest players, including American Water Works (NYSE:AWK) and Aqua America. The culprit was the Philadelphia area-based company's announcement that it had agreed to acquire privately held Pittsburgh-based natural gas utility Peoples. Here's what water utility investors should know. Under the terms of the deal, Aqua America will pay $4.275 billion in cash, which includes the assumption of approximately $1.3 billion in debt, for Peoples, according to the press release. Peoples is owned by SteelRiver Infrastructure Partners. 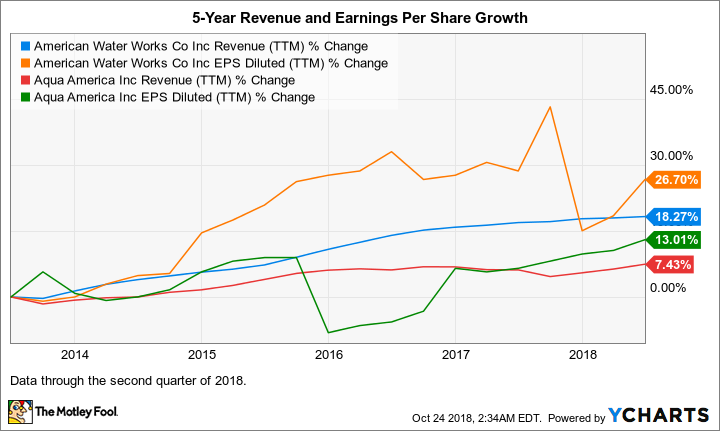 This is a marriage between the second-largest U.S. water utility (American Water Works is the largest based on many measures, including market cap) and fifth-largest U.S. stand-alone natural gas local distribution company (based on customer count). "In 2019, the new company is projected to have a U.S. regulated rate base of more than $7.2 billion, with about 70% in water and wastewater and 30% in natural gas," according to the press release. Total rate base is expected to grow about 7% annually for Aqua and 8% to 10% annually per year for Peoples through 2021. Aqua America CEO Christopher Franklin will be the CEO of the combined company. The acquisition is expected to be immediately accretive to Aqua's earnings in the first full year after close. The deal, which is subject to standard regulatory approval, is expected to close in mid-2019. There are a few reasons the market reacted so negatively to Aqua's acquisition news, in my opinion. The initial financial impact is certainly one big reason, as noted by my colleague Maxx Chatsko, who wrote: "The nearly $4.3 billion price tag will need to be met with a combination of capital raises, including issuing debt offerings as well as new shares of Aqua America." For some context, Aqua America had $53 million in cash and $2.3 billion in debt on its balance sheet at the end of the second quarter. There are likely also two other main reasons. The first is that this deal marks a huge move beyond Aqua America's core competency -- operating water and wastewater utilities. There are some key similarities between Aqua America's and Peoples' businesses -- namely, both are predominately regulated utilities, have a large presence in Pennsylvania, and distribute a product via underground pipes. That said, they're still two different types of operations, and some market participants are likely concerned about Aqua America's lack of experience in running a natural gas business, particularly one of Peoples' size. Peoples' CEO will continue to run the natural gas business once it's under Aqua's ownership, so this should alleviate some concerns about experience. Additionally, water utilities are widely considered the most conservative type of utility investment, and adding a significant natural gas operation increases the overall risk level. Demand for water is extremely stable -- but the same isn't true for other commodities, including natural gas. Consumers and businesses may cut back on many things, including natural gas for heating, when prices rise, but they're generally not going to reduce their water use. Should investors in American Water Works be concerned about it striking a similar deal? The short answer is no. Of course, nothing is a sure thing (OK, except for death and taxes -- and an 80s movie of a very similar title), but the chances of American Water striking a similar deal seem minuscule. Making a sizable deal outside of its core business seemed somewhat inevitable for Aqua America. That's because it doesn't have the same growth opportunities in the regulated water utility realm that American Water does, as we'll further explore in a moment. Wall Street expects American Water's earnings per share to grow at an average annual rate of 8.2% over the next five years, and Aqua's (pre-acquisition) to grow at just a 5% average annual pace. That would be just more of the same, as despite its larger size, American Water has been growing faster from a revenue and earnings standpoint than Aqua America for some time. 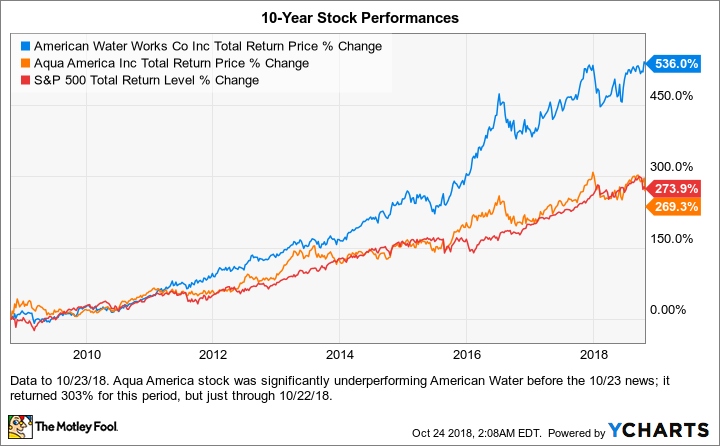 Not surprisingly, American Water's stock has significantly outperformed Aqua America's over the long term. Its geographic diversity -- it has regulated operations in 16 states, double the number as second-most-diverse Aqua America -- provides it with more opportunities for efficient expansion than its competitors. Expanding near where it already has operations results in economies of scale. This geographic diversity also better insulates it from region-specific challenges, such as droughts. The water utility space is very fragmented, so plenty of municipal-owned systems should continue to come to market as municipalities offload their systems to generate cash and lessen their expenses. And American Water remains in the catbird seat with respect to scooping up desirable acquisitions. While Aqua America could be quite successful as a combined water-natural gas utility, American Water Works is the better bet for investors who place a premium on low risk. Aqua America's dividend is a little higher -- it jumped from yielding 2.3% to 2.5% as a result of yesterday's stock sell-off, while American Water Works' dividend is yielding 2%. However, American Water has been raising its dividend significantly more than Aqua has in recent years -- to the tune of about 50% more over the last three years. 3 Water Stocks Win Upgrades: Are Any of Them Buys?